This past week, my oldest two children and I spent some time looking at public domain photos of different points in American history for an art project. Some of them really inspired me, so this week’s entry has quite a few of them. A friend of our family was recently deployed to Afghanistan, and at the same time, our son’s school is engaging in a “thank you” letter writing campaign to veterans of past wars. Because of that, the issue of people going off to war has been on our minds lately. This picture just grabbed us. A beautiful image of love in a time of war. What good is money if you don’t have anything that you otherwise value? All money does is let you align your life with the things that you value. If you’re not doing that, then what value does it have? 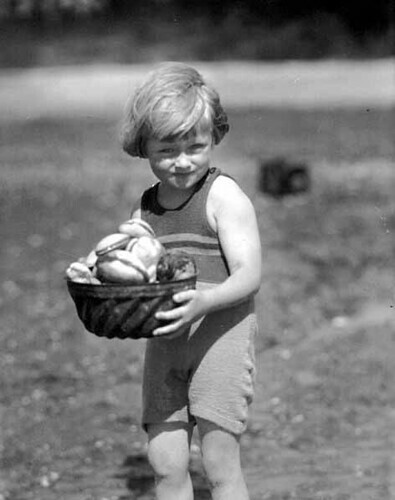 When we came across this picture, we started a long discussion about why this young child was working, carrying what looks to be a reasonably heavy basket of clams. This led us to a long conversation about how in some societies young children have to work to help out the family. We spent some time wondering about this child, particularly whether this child was working or was playing some sort of game with clam shells. What is this child’s world like? One can’t help but wonder. Financial independence is the result of something else. 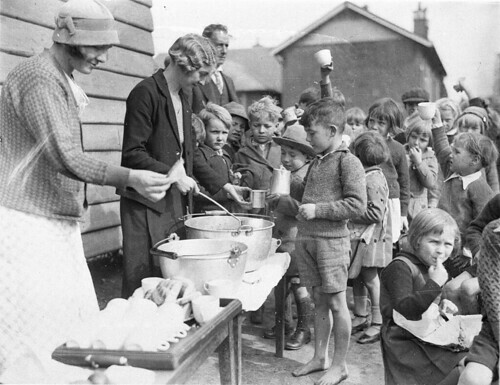 Whenever I hear someone complaining about the sorry state of the economy, I think of pictures like this one, depicting people lining up in soup kitchen lines in the 1930s because there was simply no way for them to get food at home. Banks where people had their life savings vanished with all of their money. Unemployment reached 30% – and much higher in some areas. This picture inspired a long conversation with my oldest son about poverty. This picture inspires me because it reminds me that things can always be far worse than they are. We are all really pretty well off. There are times when it’s not convenient for me to work at home. When that happens, I try to work at the library, but that doesn’t always work out, either. Coffee shops can work, but if they’ve got a lot of people, those sometimes fail. A few times a year, I just need a cubicle somewhere for the day to just get some stuff done. That’s exactly what LooseCubes helps with. It can tell you where you can find a desk somewhere to work without interruption. This site really helped during our Seattle trip when I had an emergency to deal with and needed a distraction-free place to work for a while. I left it bookmarked and recently found it again, realizing how useful it can really be for people who are self-employed. This picture is famous for a reason. 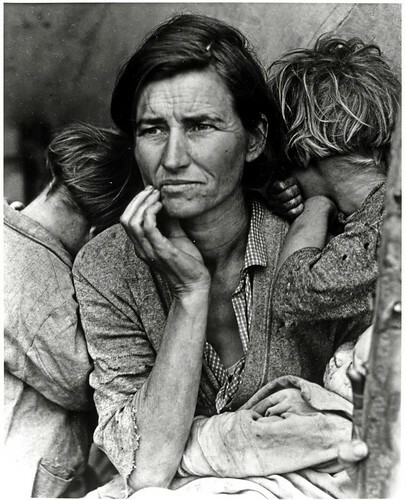 The look on this woman’s face and the situation she found herself in as a post-Dust Bowl migrant with children is a painful one. My daughter looked at this for a long time and called the woman a “sad mommy” and wanted to know why the children weren’t trying to make her laugh. I gave her a hug and said, “I think they’re just hugging each other.” She put her arms around me and didn’t say anything for a while. Whenever I think about the past too much, I tend to feel melancholy. Similarly, whenever I feel melancholy, I tend to dwell on the past. Today is a much brighter place than yesterday. This last picture is a bit lighter in tone than the earlier ones. 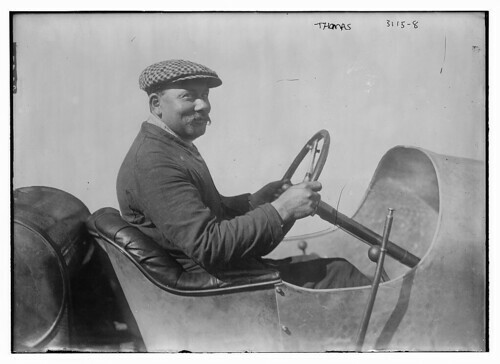 This led us to talk a lot about how much things change over a hundred years, from the car the man was driving to how he was dressed. There are so many details that are so different today, yet the situation is also familiar. He’s a person enjoying a bit of freedom. This is wonderfully spot on.